Sept. 26, 1760 "Black Rock" patented for 88 acres. May 17, 1764 "Resurvey on Black Rock" land was resurveyed for 355 acres to John Briscoe. Dec. 11, 1789 "The Sprained Ankle" was patented to Henry Hilleary contained the bulk of "Resurvey on Black Rock" plus additional acreage for a total of 366 ¼ acres. It was constructed in 1815 - 1816 by Thomas Hilleary. There is an inscription on the date stone in the east gable of the mill reading "Black Rock Mill T. H 1815". It was a saw mill and grist mill. It was driven by an overshoot wheel with a wooden race. In 1866, Hilleary sold the mill to Offutt for $2,950. 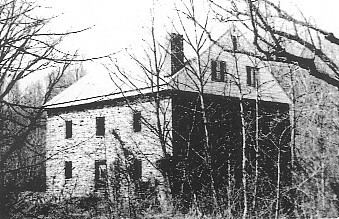 Offutt ran the mill until his death in the 1890's. On Wednesday, June 19, 1895 at 2 pm. the mill was sold at public auction to the highest bidder. It was in operation until 1920. Liberty Mill in Germantown put Black Rock Mill out of business. Ironically, Black Rock Mill sawed the logs used to build Liberty Mill. The final straw was a big rain storm which washed out the dam that controlled the water for the mill. 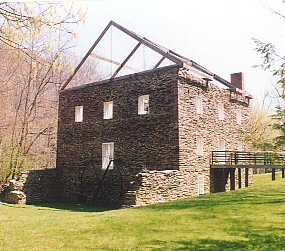 The mill house is the residence on the hill by the mill. It was gutted by fire in 2001. In 2002 , it was remodeled and rebuilt. 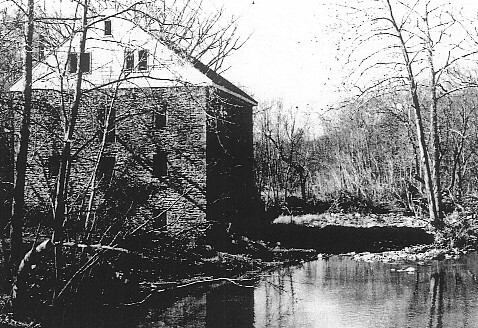 A picture of the mill in 1906 is at the Montgomery County Historical Society. <?CENTER> In 1974 the interior of Black Rock Mill has become so rotted that it had to be removed to prevent the whole building from collapsing. The roof was removed in order to hoist the rotted wood out. After that, just the walls remain. A few roof beams were added to provide a feel for what the building looked like.